This tutorial will show you how to record skype video which can be useful if you need a record of your web conversations. Before we begin you will need to have the program called Evaer installed, you can download this from “www.evaer.com”. Open Skype and log into your account. Now, open Evear and it will inform you that it is attempting to connect to Skype. Go to your Skype window and click the “Allow access” button at the top of the page. 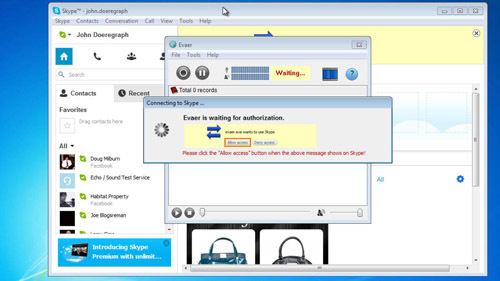 Click the “Restart Skype Now” button that appears in the Evear application and allow access in the dialog window that appears. 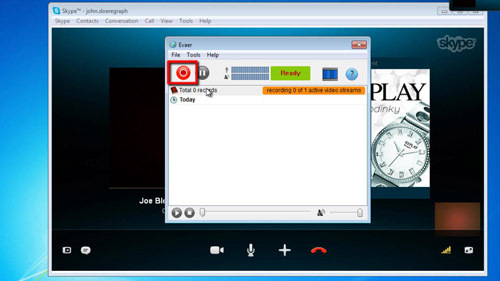 Once Skype has restarted choose the contact who you want to video chat with and click the “Video call” button in Skype. Wait for the other person to answer the call. Once the call has started and the video is up and running, go to Evaer and click on the red record button. A time will start to the right, indicating that the call is being recorded. 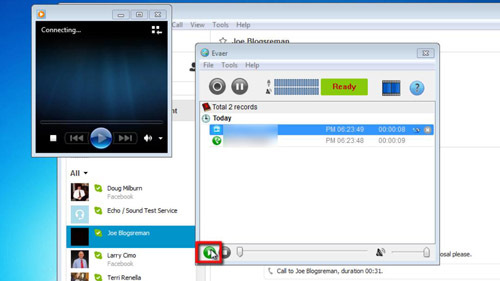 When you have recorded what you want from the call click the stop button where the record button was previously. Evaer will save the file for a moment and then it will appear in in the frame below the toolbar, now end the call in Skype if you wish. Click on the recording and click the play icon in the bottom right to watch the video. This is the simple procedure for learning how to record skype video.